Your Yorkshire Christmas begins here! A warm Dickensian welcome awaits at Kelham Island’s biggest event of the year! Join them for festive fun and shopping with over 120 stalls, traditional crafts and skills, fairground, Santa’s Grotto and reindeer! The market will be officially opened at 10:00 on Saturday 29th by the Lord Mayor of Sheffield, with visitors being welcomed in by the Sheffield City Giants. A joyful gathering of local Brass Bands, Musicians, Players and Carollers will be raising spirits and warming hearts around the Market Quarters and from the performance stage this Victorian Christmas Market! On Saturday 29th November the team at Marketing Halifax bring you a sparkling display to get you excited about the festive season. The Halifax Christmas Lights Switch On takes place between 2pm and 6pm, on Russell Street, Halifax with live music, local dance groups and a few celebrities thrown in, plus Father Christmas may make an appearance (if he’s not too busy preparing the toys for delivery on Christmas Day). Danny and Rosie from the Danny Mylo Breakfast Show will be joined on stage by ONE very lucky competition winner and alongside the Mayor of Calderdale, will be lighting up the town…. Pressing the button at 4:30pm approx to turn on the lights and start the firework display. Come along and see Halifax Christmas Market take place at the Woolshops Shopping Centre. With around 20 unique food and craft stalls showcasing and selling homemade and local wares between 10am and 6pm. There’s local crafts, hot food and plenty of gifts to buy, and even free donkey rides on the precinct. And whats better is that all events are Free to attend! For three Saturdays before Christmas, Grassington travels back in time for the annual Dickensian Festival. Visitors are treated to a glorious array of sights, tastes and smells from a bygone era. The village is adorned in Christmas lights, the square and streets come alive with a traditional market with shopkeepers and villagers dressed in Victorian costume. Christmas may be the last thing on anyone’s mind but Country Living Magazine are already putting together a fantastic celebration of British craft. Join them at the Country Living Magazine Christmas Fair in Harrogate where you’ll be able to pick up unique gifts to delight your loved ones, as well as inspired ideas and decorations to bring that magical Christmas sparkle to your home. Meet hundreds of artisan designers and makers, as well as regional food producers from across the British isles and see the pages of the magazine come to life in this festive extravaganza. We are delighted to announce that one of the UK’s favourite Christmas markets is extending from four days to over three weeks for the first time in its 23-year and highly successful history. This year, enjoy St Nicholas Fair for fabulous pre-Christmas shopping for 25 days from Thursday 27 November to Sunday 21 December. There’ll be lots to celebrate, including a rolling programme of different market stalls throughout the Fair, and specialty stalls featuring Food, Sparkles and Toys. As usual, snug wooden huts and pretty lights will line Parliament Street with a traditional carousel in St Sampson’s Square. Stall holders, dressed in Dickensian costume, will be offering a huge array of gifts including jewellery, ceramics, as well as seasonal food and drinks, plus herbs and oils and decorations for Christmas. 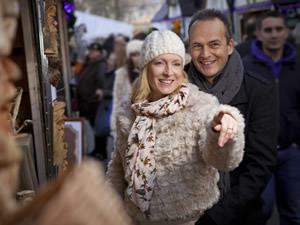 Need to find the best Christmas Markets? Want to introduce the kids to santa? Love to get outdoors in the festive season? Then our newly launched Christmas site is exactly what you need for your special Yorkshire Christmas. Also keep an eye out for the advent calendar, where there are some fantastic prizes up for grabs through December!